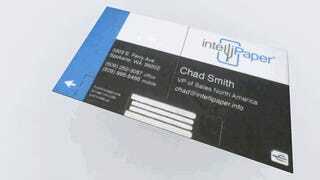 Despite countless ways for us to share information online, business cards are somehow still a popular way to pass on contact info. So instead of trying to replace them, the creators of the swivelCard simply found a way to make business cards better with a built-in USB port that lets you share everything from your resume, to a photo gallery, to a video—and not just your name, email address, and cellphone number. The swivelCards feature a simple folding mechanism so that when you're handing them out they're perfectly flat and easy to pocket, but when transformed they reveal a pop-up USB flash drive with enough storage to direct someone to additional online materials that you can add to, remove, or update at any time. In order to refine and polish the back-end system for managing the smart business cards, including allowing users to keep track of where and when the cards have been used, the swivelCard creators are hoping to raise $10,000 on Kickstarter to fund additional development.